I could have merely updated Adsense Nonsense, but the events following that post merit their own article. Maybe I am Guy Kawasaki, afterall. Less than a day after posting my frustration with Adsense, Matt Cutts left a comment and forwarded my article to Brian (last name not given) in management at Adsense operations. Brian phoned me Friday morning, but I didn’t speak with him as I’ve posted here before, I don’t answer calls that block caller id. Later he emailed to inform me that he was aware of the problem, had received communication from both Matt and Suzie, and that my check was going out FedEx immediately. To my astonishment, someone from Google not only heard my plea, but went further and acted on it. I want to thank Brian, Matt and Suzie for working to solve this problem and make things right between Adsense and me. My check arrived this morning via FedEx, as promised. The lingering question for me is whether to reconstitute Adsense on mobilejones.com. I remain undecided. Brian’s email assured me that they were looking at my case to see where improvements could be made to ensure there are no repeats of this problem. I’d like to hear about those solutions when they are implemented. 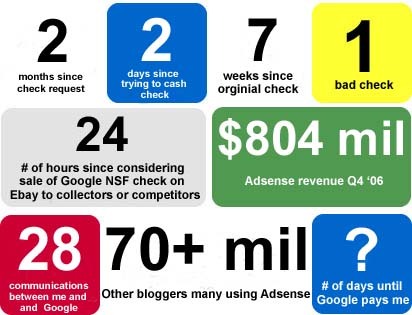 Maybe you have a suggestion for what I should do in regards to Adsense. What would you do?